So, this week has mostly been spent moving into our new house. The place on King Street (the white one here if you're interested) was chosen by us mainly for being available at a reasonable price when we appealed to churches in Loughborough to help us find somewhere to live. Our landlords, Rich and Caroline, are also part of Open Heaven (Rich is now in my cell group), are very nice people and very good as landlords. (so if you want a house, then ask them for it!) It had been a bit of a shot in the dark - we signed the lease without having seen it as I wanted to minimise the number of thousand-mile round trips necessary before the move south. The house was a little smaller than our Aberdeen one, but quite suited to our needs. Unfortunately, with another child coming, and the expected deluge of visitors, it's just a bit too small for us, so we've got a larger place. Naomi was very good at helping pack. I gave her a big pile of plastic coathangers and she went back and forth, one at a time, putting them into a Shore Porters box (yes, we kept them from last time). Once that was done, the empty wardrobe seemed a most appealing place to be. Can you spot the child? On moving day, Naomi had a good run about in the new house. Lots of space and new things to explore! Now the house is full of boxes and furniture. Thanks to Jim for borrowing a work van to do the move, numerous other helpers for carrying stuff, and the people at Beacon Road for temporarily storing our extra cupboards and shelves. The new house is near to a new park, with TWO slides. This is much appreciated. So, farewell house, we were very appreciative to have you as our first family home. 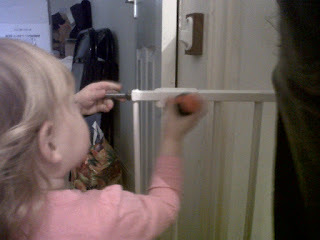 I close with Naomi helping to set up the stair gate in the new house. By the way, this week the students are back in Loughborough, and they are EVERYWHERE! Campus is a tad busy again today.